Patron saint of all priests. The French Revolution forced many loyal priests to hide from the government in order to carry out the sacraments in their parish. In order to attend Mass, even though it was illegal, the Vianneys travelled to distant farms where they could pray in secret. Since the priests risked their lives day by day, Vianney began to look upon priests as heroes. Vianney was 20 when his father allowed him to leave the farm to be taught at a "presbytery-school" in the neighbouring village of Écully, conducted by the Abbé Balley. Vianney struggled with school, especially with Latin, since his past education had been interrupted by the French Revolution. Only because of Vianney's deepest desire to be a priest—and Balley's patience—did he persevere. 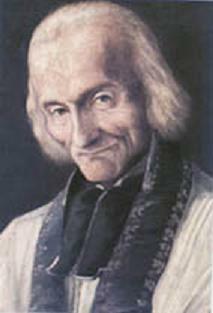 In 1818 Jean-Marie Vianney was appointed parish priest of the parish of Ars, a town of 230 inhabitants. Vianney yearned for the contemplative life of a monk, and four times ran away from Ars, the last time in 1853. He was a champion of the poor as a Franciscan tertiary and was a recipient of the coveted French Legion of Honor, which, however, he refused to accept. On 4 August 1859, Vianney died at age of 73. The bishop presided over his funeral with 300 priests and more than 6,000 people in attendance.